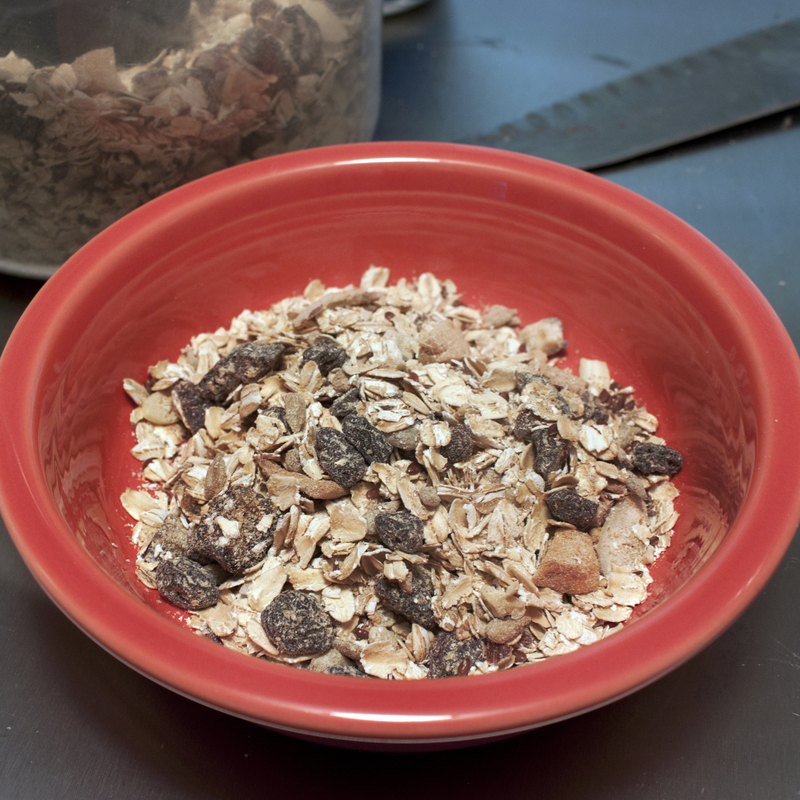 Mix the oat, nuts and grains in a large bowl. Measure oil into the measuring cup and swirl it around before pouring into bowl. Then measure out the honey in the same, unwashed cup. The oil will help the honey exit the cup. Toss everything together until evenly coated and then pour out into a baking pan. I use a large roasting pan, as it keeps everything contained. A cookie sheet with a lip also works, but you have to stir it slightly more carefully if you use that. Bake at 300° F for 30 minutes, turning it with a spatula every ten minutes or so. You want everything to be an even golden brown. When it is finished cooking, returned the baked granola to the mixing bowl, add the raisins and fruit and stir to combine. To form bars, line a rectangular baking dish with wax paper. Immediately pour the warm granola into the dish, cover with another piece of paper, and press down HARD, packing the granola as tightly as possible. Let the pressed granola harden cool for at least 3 hours (i let mine sit overnight) before cutting. My pan yielded 14 thick granola bars. For lack of more sustainable packaging ideas, I wrapped them up in some saran-wrap.